The Explorer III Off-Road Handcycle is a unique handcycle designed to tackle extreme off-road conditions and provide unparalleled opportunities to get up close and personal with places that until now have been inaccessable. Places like mountains, trails and the beach are no longer out of bounds, the Explorer Off-Road Handcycle will take you there and to the top. This unique off-road handcycle has already taken many users to the highest peaks of Europe, including the Alps and the Tatra mountains. The Explorer also took part in a successful climbing expedition to Mount Killimanjaro – the highest peak of Africa. 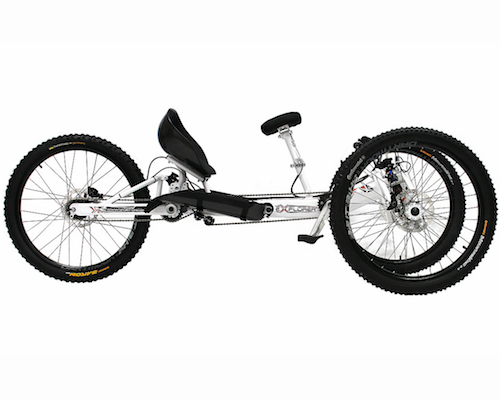 The Explorer III is the most advanced off-road handcycle of it’s kind with features such as full independent suspension, hydraulic disc brakes all round, Schlumph Mountain Drive and a choice of drivetrain ranging from 16-22 gears. One of the great features of the Explorer is the chest steering used to keep the bike in a straight line or negotiate turns when pedaling. The handlebars are there for flying downhill. Rims: Dartmoor Rocket/Rider/Shield depending on version.